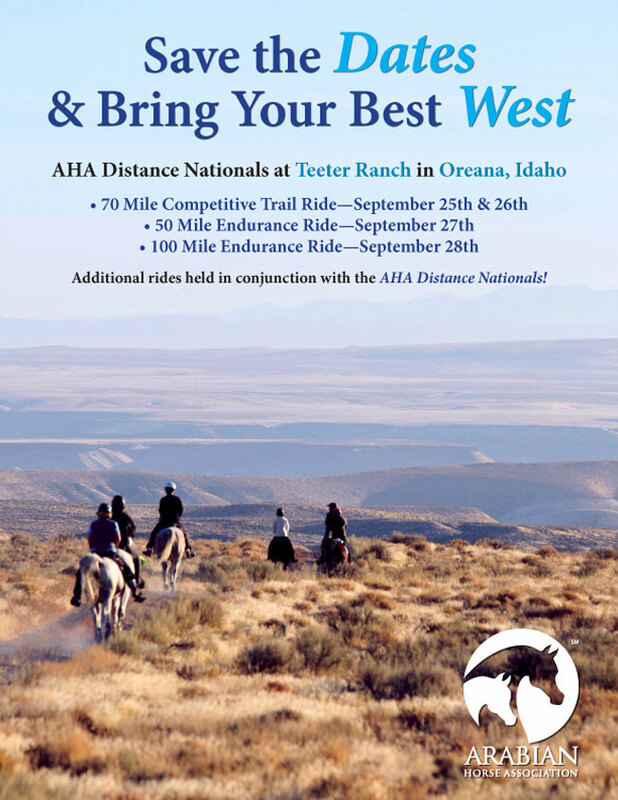 The 2014 AHA Distance National will be held on September 25-28 at the Teeter Ranch in Oreana, Idaho. Events will include the 70-Mile National Championship CTR Ride on September 25 and 26 (35 miles each day), the 50-mile Championship Endurance ride on September 27, and the 100-mile Championship Endurance ride on September 28th. Open AERC Limited Distance rides, 50-mile rides, (the Owyhee Canyonlands Pioneer ride), and an AERC open 100-mile ride will also be held concurrently. Ride managers are Steph Teeter and Regina Rose. Head veterinarian is Mike Foss. For questions about the Distance National Championship Rides, please contact Ride Coordinator Devin Smith at Devin.Smith@ArabianHorses.org.